Construction is moving right along at Preston Lake. Two story townhomes without basements or garages are being built. Three story townhomes with garages are being built. Quite a few single family homes are under construction and under contract. Building lots are available for sale. High end apartments will soon be built next door to Preston Lake. Learn more about 3168 Preston Lake Boulevard. Explore all listings at Preston Lake here. If you have drive by the intersection of Route 33 East and Stone Spring Road anytime recently you have likely seen the mass grading that is under way. Route 33 runs top to bottom on the left side of the photo. Stone Spring Road runs left to right. The near side of Stone Spring Road, where grading is just barely beginning, is the future location of a gas station / convenience store. The far side of Stone Spring Road, adjoining Preston Lake, is the future location of high end apartments being built by a developer out of Charlottesville - though not all of the land being graded will be used for these apartments. See below. Read more about the ownership of the land, and the apartments here. The Rockingham County Planning Commission will consider a request on Tuesday for a further revision of the Preston Lake master plan. The most recently approved master plan showed one large 168-unit apartment building, and the new master plan will include 12 smaller apartment buildings, presumably with 14 apartments per building. Per my math, each of these (12) apartment buildings would have (14) apartments in it -- which I'm assuming might be a three-story apartment building. It has been a while since I posted a sales update on Preston Lake -- the area's largest (intended) mixed use community that was started just before the real estate boom, was foreclosed on, was purchased by a new developer, and now seems to be gaining some momentum. Of note -- these sales (above) are all of the sales shown in the MLS. It is likely that there have been a few other sales direct from the builder/developer to buyer that are not reflected in the MLS. If you have questions about Preston Lake, check out their website, or email me (scott@HarrisonburgHousingToday.com). My dad lives at Preston Lake and I am over there quite a bit. It has now been almost 10 years since Preston Lake originally obtained County approval. 8% of the planned housing units (65 of 819) are built or are under construction. 13% of the detached homes (21 of 168) have been completed. 16% of the townhouses (39 of 239) have been completed. 5% of the new "villas" (4 of 76) are under construction. Work has not yet begun on the 336 apartments approved for the community. The renderings above show the new "Villa" product under construction at Preston Lake. The first building to be constructed includes four attached properties -- two end units each with a single garage -- and two interior units each with a double garage. The townhouses have been delivered! Well, at least the walls have. The townhouses will apparently be built with pre-framed walls. If you haven't already seen it, this is Preston Lake's model home. The upgraded entrances to Preston Lake are certainly looking good. There is even a new wall along Massanetta Springs Road that provides a bit more definition to the community. Finally, construction is almost complete on the bridge across the end of the expanded lake. For more information about Preston Lake, feel free to email me at scott@HarrisonburgHousingToday.com or call me at 540-578-0102. Preston Lake, a large (500-ish unit) mixed use development east of Harrisonburg began selling homes in 2008, was foreclosed on by Wells Fargo in 2011, and was then acquired by a developer out of Maryland in 2012. As shown above, the lake has been drained and is being repaired, as there seemed to have been a leak that was preventing it from staying full. Not shown above, a new brick wall is being built along the edge of Preston Lake at Massanetta Springs Road, which will be accompanied by a revamped entrance. A new model home has been built that showcases what the new builder is offering. Take a drive through Preston Lake sometime soon to see the changes that are under way, and if you have questions, feel free to email (scott@HarrisonburgHousingToday.com) or call me (540-578-0102). The bulk of Preston Lake subdivision (mostly undeveloped building lots) was foreclosed on in 2011, but last week was purchased by a neighboring land owner --- a developer from Maryland. If you refer back to the amount of debt that was foreclosed on ($20M) and compare that to the new purchase price ($2M) we can assume that the previous developer's lot basis was 10 times higher ($100K for single family home lots, etc). Hopefully, these low costs per lot listed above will allow the new developer to build products and offer finished homes at a price point that will allow the subdivision to start moving forward again. UPDATE: After further review of the deed transferring the property from Wells Fargo, I am now noticing that the new developer has agreed to pay a "Subsequent Fee" to Wells Fargo of 2% of the gross sales price of any of their newly acquired properties (building lots or lots where they have built homes) when it closes. This only applies to transfers within the first five years. It is with great pleasure that I am writing this letter on behalf of MLK Preston Lake, LLC, the new owner of the Preston Lake Residential property. Being already invested in and committed to the success and vitality of the area through ownership of a portion of the adjacent commercial property, we look forward to reinvigorating the Preston Lake Residential development with this acquisition. We are confident that the existing homeowners in the neighborhood, Rockingham County officials, and the entire surrounding community will be very pleased with the quality and expertise that we will bring to Preston Lake. We are looking forward to meeting all of the current homeowners in the community, and working with you to unveil our plans for the balance of the project. We have teamed up with an award winning home builder and architect from Virginia on this project, and we all look forward to presenting our vision of the future of Preston Lake at a homeowners meeting on January 8th. Kenneth H. Michael, founder and Chairman of the Board of NAI Michael, created a Development Consulting Division to assist landowners and developers through the then increasingly complicated permit approval process. Over the years, as the approval process has become even more complex, time consuming, and technically demanding, NAI Michael's Development Consulting Division continues to stay abreast of the changes and requirements associated with the development process. As the development consultant, NAI Michael has developed over 10,000 acres of land for various owners in the Washington DC Metropolitan Area. They developed or redevelop land in all zoning categories. NAI Michael has played the role of consultant in commercial and industrial projects in excess of eight million square feet of gross building area. In addition, their residential development activities have provided thousands of quality homes for families throughout our community. Their clients range from the small investment owner, to the most sophisticated, large corporate user. The finest testimony to their expertise is the high number of experienced builders and developers that rely heavily on the knowledge, experience, and advice of NAI Michael experts. The Michael Companies also seems to be amidst the development of a $900 million, 382-acre, upscale mixed-use community in Prince George's County. While The Michael Companies might be an out of town (out of state!) development company, they are no stranger to the Harrisonburg and Rockingham County area -- nor the general vicinity of Preston Lake. Over the past several years they have purchased a variety properties surrounding Preston Lake including (but not limited to) those outlined on the map at the top of this post. If the development of Preston Lake had taken place just five years earlier, it might have been a much greater, faster, happier success story. Given its timing, however, Preston Lake was developed and constructed at a very slow rate, which recently reached a significant milestone when Wells Fargo foreclosed on the remaining developed lots at Preston Lake. Why did it happen? It could have been the decline in the housing market....or the decline in the national economy....or that the developer's bank (Wachovia) went out of business....or many other reasons. Homeowners Association: The Preston Lake Homeowners Association is still controlled by the developer, which is now effectively Wells Fargo. For now, however, the on-the-ground association management is being handled by a Harrisonburg-based association management company, and thus far it does seem as if any services to residents will be interrupted, nor will dues increase. Ownership of the Land: The undeveloped residential lots all transferred to Wells Fargo (or REDUS VA HOUSING, LLC as it appears at the courthouse). Read more. Lot 9C: This rowhouse is completely constructed, and was actually used as a temporary residence for a couple that then later bought a rowhouse at Preston Lake. Wells Fargo contracted (at the trustee sale) to buy this rowhouse for $270,600 and it transferred to them as of late February. Presumably, this property will soon be listed for sale with Wells Fargo as the seller. Lot 10B: This rowhouse was framed, and the exterior shell was complete, but neither the insulation nor the rough mechanicals were installed. Wells Fargo contracted (at the trustee sale) to buy this rowhouse for $39,960, however another party (Southern Classic Inc) later contracted to buy it instead, and closed on the purchase a few weeks ago (March 4th, 2011). Lot 11C: This rowhouse was complete through drywall, but had a variety of trimwork, flooring, and other finishing work yet to be completed. Wells Fargo contracted (at the trustee sale) to buy this rowhouse for $157,760, however another party (Southern Classic Inc) later contracted to buy it instead, and closed on the purchase a few weeks ago (March 4th, 2011). Lot 12C: This rowhouse was complete through drywall, and rough mechanicals, and insulation, but the entire remainder of the townhouse was yet to be constructed. Wells Fargo contracted (at the trustee sale) to buy this rowhouse for $79,080, however another party (Southern Classic Inc) later contracted to buy it instead, and closed on the purchase a few weeks ago (March 4th, 2011). Current Listings: Three re-sale properties are currently on the market. Click here for details. A variety of documents were filed at the Rockingham County Circuit Court on Wednesday, February 23, 2011 finalizing the Trustee Sale of Preston Lake subdivision. In Summary: A trustee sale took place on February 3, 2011 on the steps of the Rockingham County Circuit Court, whereby Wells Fargo (as the only, and thus highest, bidder) contracted to buy back Preston Lake from its developer. Now, the deeds have been recorded transferring the bulk of the subdivision to Wells Fargo and the common areas to the Homeowners Association. The Value of 124+ Acres: The consideration paid by Wells Fargo for the 124+ acres was $3,500,000, but the trustee's deed also indicates that the appraised value is/was $4,530,000. Somewhat astonishingly, the two loans (notes) that were being foreclosed on appear to have been for a sum total of $20,500,000. The New Owner of Preston Lake: The grantee on the deed is listed as "REDUS VA HOUSING, LLC" -- an LLC registered in Deleware. The grantee's address, however, is Wells Fargo Bank out of Jacksonville, Florida. Value of the Common Areas: Per the deed transferring the common areas to the Homeowners Association, the common areas have an assessed value of $323,700. What Conveyed To The Homeowners Association: The map above is based on an early engineering plan for Preston Lake. I have deciphered (to the best of my ability) the deed, and recorded plats for Preston Lake to mark on the map (letters in circles) the areas that conveyed the the Homeowners Association. Click on the map for a high resolution PDF, and scroll to the bottom of this post for the source files for the deed and plats. Management of the Homeowners Association: The Homeowners Association's mailing address is referenced in the deed as the same Jacksonville, Florida address for Wells Fargo. Homeowners at Preston Lake have been informed that Wells Fargo will be hiring an association management company in the very near future to handle the business of the association. Wells Fargo will bring in an association management company to handle the association. Wells Fargo will market and attempt to sell the entire subdivision to a new developer. If the above is not successful, Wells Fargo may attempt to sell individual lots at Preston Lake. Jan 19, 2011: Preston Lake Headed To Foreclosure? Local History in the Making: It's not necessarily the good type of history, but this was the first major subdivision --- and hopefully the last --- to be foreclosed on in the Harrisonburg area. Many other areas across the country have seen multiple large subdivisions be foreclosed on, but until today, Harrisonburg had been unscathed. The timing of the development of this subdivision is likely what led us to today's events, as the development began just as the housing market began to slow dramatically. Only One Registered Bidder: Only one individual registered as a potential bidder at the sale (by showing his deposit check to the Trustee, and providing his name), though he did bid during the auction, likely because of the opening bids from Wells Fargo. Only One Actual Bidder: There was only one actual bidder....Wells Fargo. A Hefty Price For 120+ Acres: It wasn't too surprising that there were not any bidders for the 120+ acres of Preston Lake, as Wells Fargo's opening bid was $3,500,000. The Common Areas: The attorney representing Wells Fargo also indicated that the common areas would be deeded to the Property Owners Association. The Association will still exist, and owners will still make payments to it to support the maintenance of the common areas and other common amenities of the neighborhood. What Happens Next: In theory, within 30 days, Wells Fargo will close on their purchase of the four individual rowhouses, and the 120+ acres of Preston Lake. The attorney representing Wells Fargo commented to me afterward that he thinks there is a 90% chance that the sale will proceed to closing and that Wells Fargo will be the new owner. After Wells Fargo owns the property, he indicated that they would sell the four rowhouses individually, and seek to sell the remaining 120+ acres to a new developer. It is unclear what price they will ask for the remainder of the subdivision (likely lower than $3.5M), and it is unclear what price they will eventually take for the remainder of the subdivision (likely lower than $3.5M). Wells Fargo's attorney also indicated that while they will attempt to sell the entire undeveloped section of Preston Lake as a whole to one developer, it is also possible that they would sell the property as individual lots or sections of lots. Wells Fargo has done this with other subdivisions around the country that they have foreclosed on, though it is not their goal. Wells Fargo is interested in money: This should come as no surprise, but Wells Fargo's goal in being the new owner of the undeveloped areas of Preston Lake are to try to recoup as much as possible of the money that they have invested in the subdivision. They won't, thus, try to unload the property for development into a mobile home park -- they will be marketing it and working to sell it for its highest and best use. This does not mean that the development plan won't or can't change -- but they will be trying to recoup as much money as possible, and thus will be trying to sell it to a developer who has the a positive (and profitable) vision for it. Those Pesky Lawsuits: The developer of Preston Lake (Richard Hine) had filed a lawsuit against Wachovia (now Wells Fargo) --- and Wachovia had responded with a countersuit. Per the attorney representing Wells Fargo, both of those lawsuits will go away once the sale closes, and the property is taken back by Wells Fargo. A Community United: If anything, the turmoil and uncertainty over the future of Preston Lake seems to have drawn its residents closer together as a community. Most of the owners were in attendance at the sale, and then went as a group to Cally's afterward to have lunch. There seems to be solidarity and general optimism (as much as is possible) amongst most (or all) of the owners. They still seem to thoroughly enjoy their homes, and each other, which is a positive sign for the future of the community. Have Questions? If you have questions about Preston Lake or the foreclosure proceedings, I'm happy to try to answer them (540-578-0102, scott@HarrisonburgHousingToday.com), or you can contact Peter Barrett of Kutak Rock, LLP, who is the attorney representing Wells Fargo. You can reach Mr. Barrett at 804-343-5237 or peter.barrett@kutackrock.com. Preston Lake Headed To Foreclosure? Per a Trustee Sale advertised in today's Daily News Record (view ad), the bulk of the Preston Lake subdivision may be headed to foreclosure. This doesn't necessarily mean that the foreclosure sale will take place, but this is a significant step in that direction. Preston Lake is Harrisonburg and Rockingham County's first master planned community, intended to include nearly 500 townhomes and single family homes, a large section of retail stores with a main street appearance, and many amenities such as a community center, soccer fields, swimming pool, and more. Now, however, all of those plans may be coming to an end, at least for now. On February 3rd at 12:00 p.m., 124.693 acres of Preston Lake is scheduled to be auctioned at the Rockingham County Circuit Court. Please note that an advertised trustee sale (all that has happened thus far) does not necessarily mean that the foreclosure process will take place. Preston Lake Homes and its developer, the Hine Group, filed claims against Wachovia in Rockingham County Circuit Court on Dec. 11 for breaking its loan contracts, according to the lawsuit. Preston Lake is seeking $32.4 million in damages for lost profit. Wachovia filed a counterclaim in U.S. District Court in Harrisonburg on Dec. 29. The Charlotte, N.C.-based bank is suing Preston Lake for $15.6 million in outstanding debt. While it was happening quite slowly, residential construction at Preston Lake had been continuing even over the past year. Since the first closing in 2008, there have been 37 sales at Preston Lake recorded in the HRAR MLS, ranging from $318k to $883k, with a median price of $421k. 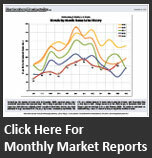 Three of these sales took place as recently as the fourth quarter of 2010. It appears that most (or all?) of the common areas (such as the Village Green) will not be sold at the foreclosure sale. The foreclosure sale will not take place, construction and sales will continue, quite slowly. The foreclosure sale will take place and the subdivision will be purchased by a new developer who will continue with the current vision, or adjust it and move forward with development, construction and sales. The foreclosure sale will take place, but nobody will buy the subdivision, and thus the bank will become the owner. They will then work to sell Preston Lake to a new developer through more traditional sales and marketing means. Same as #3, but the bank will then try to sell the lots individually, instead of as an entire subdivision. If you have questions about Preston Lake, feel free to call me at 540-578-0102 or e-mail me at scott@HarrisonburgHousingToday.com. 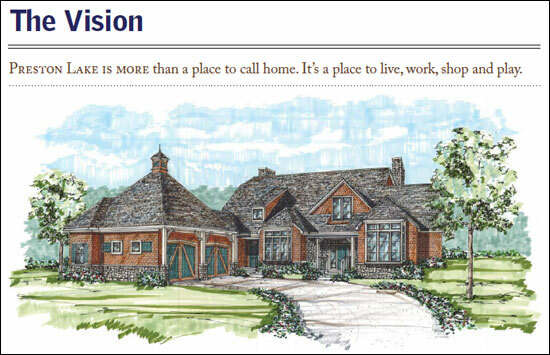 An early rendering of an estate home to be built at Preston Lake. An early rendering of the Charleston Rowhouses to be built at Preston Lake. The southwest corner of the intersection at Massanetta Springs Road and U.S. 33 could become home to a development like no other in Rockingham County. The Hine Group LLC, a Virginia limited liability company, along with an affiliate entity known as Preston Lake LLC of Port Jefferson, N.Y., has contracted to purchase 145 acres of the Preston Farm properties, according to a statement prepared by The Hine Group LLC and Preston Lake LLC. Together, the entities plan to develop a mixed-use center, the statement says, which provides both residential and commercial functions on the site at Massanetta Springs Road and U.S. 33. Included in the proposed development would be 466 town homes and single family units as well as a commercial area that would have a "Main Street" appearance, the statement says. Per the data in the MLS (reflected above) there have only been seven single family home sales, but I believe the count is actually closer to twelve when including custom contract builds that may not have shown up in the MLS . It would seem that detached homes can be built at Preston Lake for anywhere between $350k and $900k. Rowhouse sales have certainly slowed down in 2010, but over the past three years have been selling between $300k and $550k. There are currently 14 active (or under contract) listings in the HRAR MLS, priced between $299k and $814k. Five of these homes are under contract. Many developments of this scale (as close as Charlottesville) have failed over the past few years as housing markets faltered across the country. It is remarkable, and notable, that Preston Lake (slowly) marches onward. Construction on the commercial parcels has not yet begun at Preston Lake, partly due to a sluggish retail market across the country, and partly because the layout of the commercial area at Preston Lake still may be in flux as a result of the yet-to-be-fully-funded South East Connector Road. So, what's next for Preston Lake? My best guess is that residential development will continue (slowly) and that commercial development will eventually take place. The retail development, however, will likely not take place until the economy improves such that retail businesses (independent and franchises) are looking to expand once again. If you have questions about Preston Lake, feel free to call (540-578-0102) or e-mail (scott@HarrisonburgHousingToday.com) me. My parents live at Preston Lake -- they built a cottage home when they relocated to the Shenandoah Valley -- thus I'm in the neighborhood quite a bit. What Is HardiePlank Siding, And Is It Being Used In Harrisonburg? The exterior of your home could be built with so many different materials, for example: stucco, stone, wood, brick, aluminum, concrete, steel and fiber cement. That last one, fiber cement, is a vague and mysterious siding choice also referred to as HardiePlank siding, which has been around since the 1980's. It resists flame spread, making it safer in the event of a fire. It is a very durable material that resists damage from impact. It not susceptible to rotting, or termites. The color is baked on, so you won't have to paint for 15 years! Many home buyers in the Shenandoah Valley have not heard of HardiePlank siding, but as soon as they come to understand how it outperforms wood and vinyl products, they become very interested! HardiePlank comes in all sorts of colors and styles, and you'll start to see it on some newly built homes in this area, for example on the Paired Homes at The Glen at Cross Keys, on this EarthCraft home on Cottage Circle, on most of the homes at Preston Lake, and on Urban Exchange. Yesterday, I accompanied my clients on a framing meeting at the home (pictured above) that is being built for them at Preston Lake. One of the impressive aspects of Preston Lake construction is that every residence (single family homes as well as rowhouses) will be EarthCraft and EnergyStar certified. The average duct leakage on new construction homes is 28% --- that is to say that 28% of the heated or cooled air being pumped into the ductwork never makes it into the living areas of the house. In contrast, an EarthCraft home MUST have 6% or less duct leakage --- which, as you can imagine, provides for a great deal of energy savings for a homeowner. Thus far, I have been very impressed with the construction process, materials and quality at Preston Lake. As the house moves further along, I'll post some additional photos showing some additional innovations found at Preston Lake.